aRanges are given in parentheses. Abbreviations: SWL, shock wave lithotripsy; URS, ureterorenoscopy; PCN, percutaneous nephrostomy; M:F, male:female; OR, operating room. open surgery, most of them during our initial learning curve. Of the seven cases of retroperitoneoscopic pyelolithotomy, there were two conversions. The mean operating time was 108.2 minutes (range, 45-150 minutes) and the estimated blood loss was 127.2 mL (range, 60-200 mL). There were five open conversions out of 53 cases of retroperitoneoscopic nephrec-tomies for calculous disease due to nonfunctioning kidneys because of the multiple stones and chronic infection. The mean operating time was 99.7 minutes (range, 55-240 minutes) and the average blood loss was 135.6 mL (range, 40-800 mL). Of the 14 retroperitoneoscopic nephroureterectomies, we were successful in 12. Average operating time was 147.0 minutes (range, 70-210 minutes) and average blood loss was 206.5 mL (range, 70-400 mL). Average hospital stay ranged from three to four days for various procedures. There were two major complications. 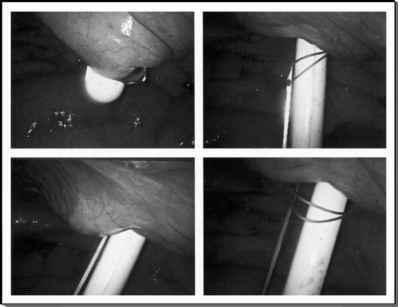 One patient with dense perinephric adhesions suffered a colonic injury during dissection with the J hook, which was detected intraoperatively and repaired primarily. Another patient sustained injury to the external iliac artery during ureterolithotomy, which was also managed to open surgically. Minor complications encountered were peritoneal rents in seven patients, postoperative fever in two patients, surgical emphysema in two patients, and wound infection in two patients. Patients undergoing ureterolithotomy and pyelolithotomy were followed with an intravenous urogram at three months. This could be done in 30 of the 40 patients following ureterolithotomy and all seven patients following pyelolithotomy. There was no evidence of any obstruction or residual fragment in any of the cases.